Niobrara had a big problem with flooding early in its history, so its residents did the only sensible thing. They moved the town. The whole town. 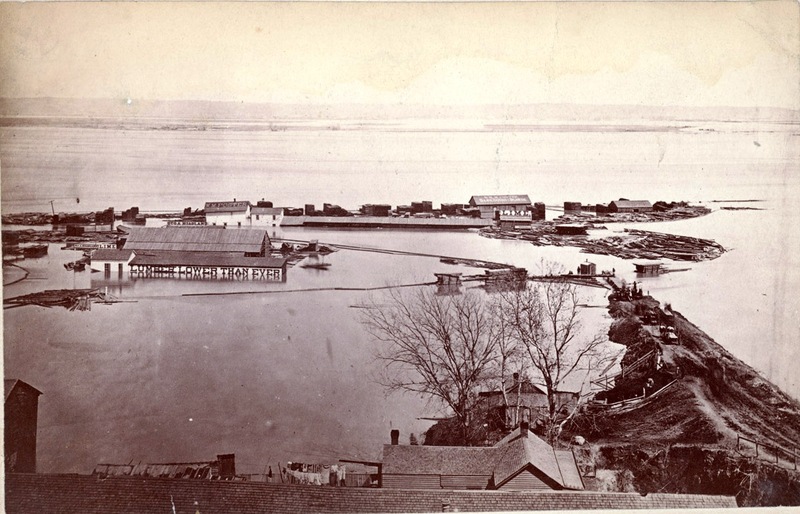 Missouri River flooding at Omaha in 1881, NSHS RG2341-898 (right). The early settlers of Nebraska faced many hardships, a great number of these weather and climate related. Among the most destructive of natural disasters were the sudden prairie blizzards. The blizzard of January 12, 1888 had an immense impact on the lives of all who remembered it. This year’s rainy season has been made more tolerable, and safer, thanks to flood control initiatives over the last 60 years. But on July 6, 1908, nearly seven inches of rain fell on the capital city, with 2.5 inches coming in one two-hour period. The creeks in the Salt Creek watershed became torrents.